Could switching to a ‘greener’ energy tariff save over £270 a year? If you’re looking to save money and the planet at the same time then a renewable energy tariff may be the right choice for you. A renewable energy tariff or ‘green’ tariff is a deal that mostly matches the amount of energy you use in your household with energy from renewable sources such as hydro, wind and solar – reducing the amount of fossil fuels used to provide your electricity supply. How it works is that all houses take energy from the National Grid – it can’t be guaranteed that the energy you are using is from a renewable source, so suppliers offering ‘green’ tariffs pledge that all energy you use will be replaced by energy from renewable sources. As it stands, 70 percent of us are currently on a standard variable tariff with our energy supplier, and could cut our annual energy bills by around £270 a year by switching to a cheaper tariff, and for not many extra ££’s that tariff could be a ‘green’ one. Added to that potential saving, a whole host of energy suppliers have recently increased their ‘out of contract’ standard variable deals and are now shifting customers onto those more expensive deals after 16 fixed-rate tariffs ended in June – making now a great time to shop around. 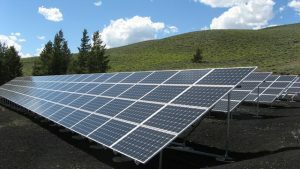 If your fixed deal has just come to an end, maybe a ‘green’ deal is worth considering – it used to be the case that the renewable energy tariffs were more expensive, with suppliers charging a premium but that is no longer the case, with over twenty renewable energy deals cheaper than the Big Six’s standard variable tariffs. Suppliers are offering more and more options, including renewable energy options, giving much more choice in the market, and being on a green tariff could be as little as 2 pence per day more expensive than the very cheapest deal out there – so chances are that, compared to your situation now, with a ‘green’ tariff you will be saving money overall, whilst mitigating your carbon footprint. If you are looking for a new deal, a great place to start is uSwitch – a comparison site for energy providers. According to uSwitch research, 18 percent of bill payers were willing to add £50 to their annual bill for a ‘green’ tariff and 24 percent were willing to consider it even if it was more expensive – but it actually doesn’t have to be. The market-cheapest deal is a non-renewable deal from Green Network Energy – with an average cost of £858 a year. According to uSwitch data, Tonik Energy is offering the cheapest ‘green’ tariff on the market at an average of £866 a year – so that is potentially just £8 more per year for the additional benefits, which include no exit fees, a £40 dual-fuel discount and 3 percent interest on all in-credit balances, whilst guaranteeing that each unit of electricity you use from the grid is replaced with electricity from a renewable source. The number of renewable energy deals available has increased hugely over the last couple of years due to demand from more eco-friendly households – there are now 30 tariffs available. This is a big increase from a slump in the earlier part of the decade when the regulator imposed rules limiting the number of deals that could be offered by each supplier to just four deals – meaning that the ‘green’ deals were largely dropped. It is great to see the smaller suppliers embracing renewable energy and offering deals to rival non-renewable energy deals.